Fishing boats in Dong Hoi. 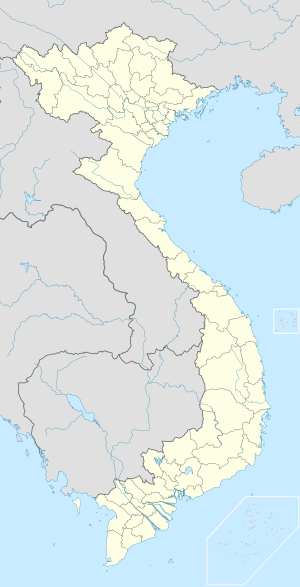 Đồng Hới pronunciation (help·info) is the capital city of Quảng Bình province, in the north central coast of Vietnam. The city's area is 155.54 km² (60 square miles). In 2005, 103,005 people lived there. It is at around 500 km (310 mi) south of Hà Nội (Hanoi), 260 km (160 mi) north of Đà Nẵng (Danang), 1,200 km (750 mi) north of Hồ Chí Minh City (Saigon). It borders Laos on the west, the South China Sea on the east, Hà Tĩnh province on the north, and Quảng Ninh in the south. Dong Hoi Airport is 6 km north of Dong Hoi. Dong Hoi is subdivided into 16 subdivisions, 10 urban wards (phường) and 6 rural communes (xã). Wikimedia Commons has media related to Dong Hoi. This page was last changed on 7 November 2017, at 17:25.